Rayovac® Blood Tracker 4-in-1 LED headlight. Hands-free illumination for tracking downed game! Tracking made easy! Slip it over your head with the included strap, and you're ready to go. Weather you're walking to your tree stand in the early morning, or tracking a big buck at night, this Rayovac® Blood Tracker 4-in-1 LED Clip Light is a must have. It's great for use as a hands-free flashlight or switch it to blood tracking mode and illuminate specs of blood for easy trailing. 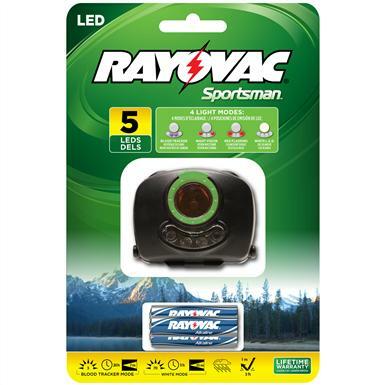 Rayovac Blood Tracker 4-in-1 LED Headlight is rated 4.8 out of 5 by 12. Rated 5 out of 5 by Vino from Nice head light. This product appears to be well made. It adjusts to whatever height that you need it. The light is more than bright enough for fishing, etc. Rated 4 out of 5 by BrotherHar from works Works well as light to get out of the woods. Have not used it for blood tracking yet.Hands free is nice. Rated 4 out of 5 by Swamphunter13069 from A VERY GOOD PRODUCT FOR THE PRICE. While there are other products out there that are brighter, the light is sufficient for my needs. I tested the blood tracker light on a deer we shot and it seems to work. We drive to our deer stands with ATVs with the headlights turned off so as not to alert the deer any more than necessary This product will light our way with the white light and then switch to red for a short walk to the stand. I could have used a product like this many times over the past 45 years of hunting. Rated 5 out of 5 by Flatland Farmer from Eliminate, those lost critters. Little early, not yet hunting season. This neat head lamp, frees up your hands for recovery of that venison or wild boar; also gives you light to accomplish those late hour Honey-do's. Also; provides an ability to signal for "HELP" in an emergency situation. Should be added to vehicle, roadside assistance kit. Rated 5 out of 5 by hacksaw from Great replacement My old head lamp served me well but like everything else over time it broke. Found this on Sportsman's Guide and seen the shipping and price I jumped on it. This light was a great replacement for my broken one. It has all the features I need. Will use it for hunting , working on the house and car. For the price you can't beat it. Rated 5 out of 5 by Bobby from Great Product This was bought for a certain use and works well for what we intended it for.